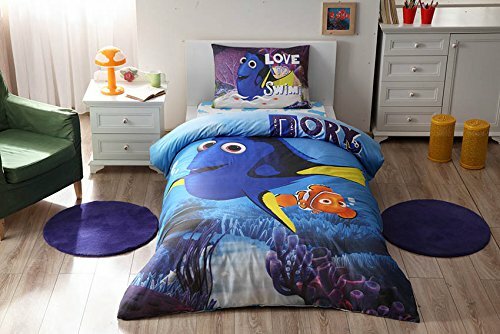 100% Cotton Disney Finding Dory Bedding Duvet Cover Set New Licensed / Finding Dory Movie Twin Size Duvet Cover Set / Finding Dory Bedding Set 3 PCS / Single Set includes: Duvet cover: 160 x 220cm. (62,99''x86,61'') Fitted sheet: 100 x 200cm. (39,37''x78,40'') Pillow Case: 50 cm x 70 cm. (19,68''x27,55'') Comforter / Quilt not included!!! Comforter / Quilt not included!!! If you have any questions about this product by store_turco, contact us by completing and submitting the form below. If you are looking for a specif part number, please include it with your message.